Are you looking for a gift for any customers? Well, then you are at the right post. 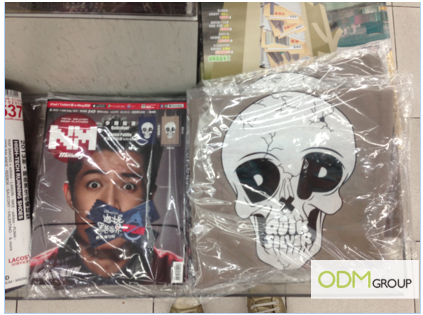 This time, we are looking at customized totes that is given away with the purchase of NM Magazine. NM magazine is giving away customized totes with purchase of their monthly issue! A large space to customize your brand name and brand logo, read on more to find out why customized totes are the perfect choice for giveaways! Customzied totes are the best for any brands. It is a perfect platform for you to market your brand. People carry their totes around often and with your logo on it, it becomes a perfect method to market your brand. When your clients carry it, they are also helping you to market your brand. Other people would see the tote and think about your brand. This would help in the brand awareness of your company in the midst of all other brands! Customized totes are very user-friendly because any gender can use them. They are also suitable for many occasions. From outing, to picnic and even to going for dates, customized totes are certainly great to use. It is fashionable and people would use it. Hence, all industries should highly consider giving away customized totes. Fashion industries should consider customized totes. This is because totes are considered a fashionable accessories piece and if the customers are looking for fashionable brands, they will think of your brand first. Industries who target families and kids can also consider this giveaway. This is because the tote is large enough to fit many things. Family outings usually require a large bag to keep many things. A tote has ample of space and it is prefect for family trips! Thus, hesitate no more and contact us today! We also offer design services so tell us your idea and we can realize your dreams in your customized totes!